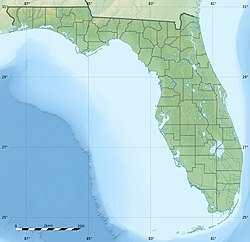 Lake Manatee is an artificial reservoir located in Manatee County, Florida. State Road 64 crosses the eastern end of the lake, while the Lake Manatee State Park is found at the southwestern end. The Manatee River flows into the lake at the eastern end, then continues to the west, where it flows into Tampa Bay. Lake Manatee is a major source of water for Bradenton and other cities in Manatee County, providing 32 million gallons per day. Lake Manatee State Park is located on the south shore of the lake. ^ "Manatee, Lake: Overview & Current Conditions". Manatee County Water Atlas. University of South Florida Water Institute. Manatee County. Retrieved April 12, 2018. ^ a b Bellino, Jason C.; Pfeiffer, William R. (2010). Bathymetry of Lake Manatee, Manatee County, Florida, 2009 (Map). Scientific Investigations Map, 3112. USGS. OCLC 618229629. This Manatee County, Florida location article is a stub. You can help Wikipedia by expanding it. This page was last edited on 12 April 2018, at 22:14 (UTC).